The Kesslerloch Venus has been made from a piece of jet. It is 28 mm long, 8 mm wide and 6 mm thick. The front of the original surface of the workpiece has been the more carved. The breasts have been shown by a V shaped notch in the upper part of the figure. In the same fashion, the legs are separated by a V shaped notch. The back of the figure mostly still shows the original surface. Overall, the whole figure is angular and unfinished. Perhaps this is only a work in progress. It was discovered in 1954 by W. Mamber in the old excavation of Jakob Nüesch at Kesslerloch. Kesslerloch is a Swiss cave discovered in 1873, west of Thayngen, in the canton of Schaffhausen, a Palaeolithic site, with many discoveries of stone, bone and reindeer antler. The statuette was discovered in 1954 by W. Mamber in the old excavation of Jakob Nüesch at Kesslerloch, and in 1975 was given to the Völkerkundemuseum (today Museum der Kulturen) in Basel. The figure has been made from a piece of jet. It is 28 mm long, 8 mm wide and 6 mm thick in the upper body, but only 4 mm in the legs. 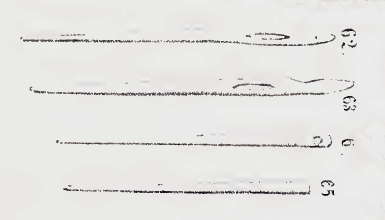 Cut marks from processing are still clearly visible. The front of the original surface of the workpiece has been the more carved. At the top of the breast the surface has not been significantly altered, while the head and the leg area have been worked flat. The breasts have been shown by a V shaped notch in the upper part of the figure. In the same fashion, the legs are separated by a V shaped notch. The back of the figure mostly still shows the original surface. Overall, the whole figure is angular and unfinished. Perhaps this is only a work in progress. Very similar figures have been found at Petersfels bei Engen (Baden-Württemberg). 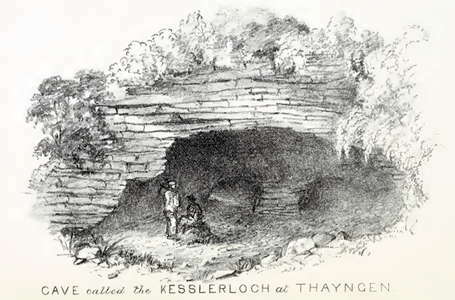 Kesslerloch, at the main North East entrance. Kesslerloch is a Swiss cave discovered in 1873, west of Thayngen, in the canton of Schaffhausen, a Palaeolithic site, with many discoveries of stone, bone and reindeer antler. 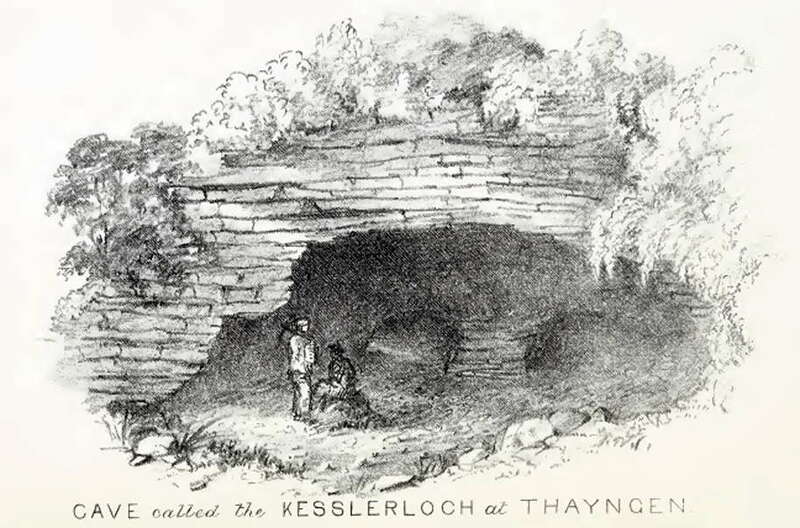 The first time I entered the Cave of Kesslerloch was in the summer of 1873, when on a botanical excursion. It was then completely overgrown with trees and shrubs ; in fact in summer the interior was altogether closed to the chance passer-by. 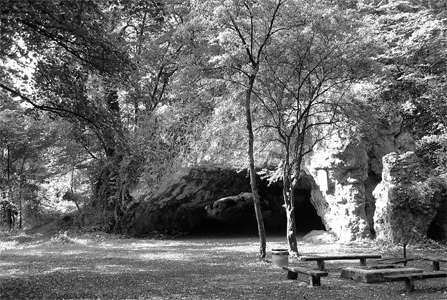 As I had been stationed at Thayngen hardly a year, the cave was entirely unknown to me, and probably would have remained so, but for the fact that the Alliaria officinalis (Garlic Mustard) flourished in the neighbourhood in great abundance and of unusual size, and this led me to it. I could not resist securing such specimens, and thus was in a position to notice the yawning background of the cavern through the bushes, where they were least dense. Having pushed with some difficulty through the foliage, I was not a little astonished to find that behind all this life and verdure I was surrounded by bare walls of rock. For some years past I had given much attention to geology and the study of prehistoric man, and I was strongly impressed with the idea that this cave, like those of other countries, might have been the abode of some of the human race in prehistoric times. I then formed the determination to make excavations. But the realisation of this intention had to be put off for some time. The summer and the autumn passed away, and the ground was already covered with light snow, when a lecture which I had to give on volcanos reminded me strongly of the resolution I had made, but which had well nigh faded away from my memory. I communicated my ideas to my colleague, Mr. Wepf, who confirmed me in my determination, and offered to join me in the excavation. Thus on December 4 we went to the Kesslerloch with two of our older pupils, shovels and pickaxe in hand. The ground was already hard frozen, but by chance we dug a trench in a very instructive place. Entrance to the cave in 1875. Regular systematic excavations began on February 19, 1874, and with little interruption continued till April 11 - in other words fully seven weeks ; and on the average five men were at work the whole time. There are two openings into it; that to the south, 10 feet broad, is about 7 feet above the level of the valley, and towards the west widens out into a cavity from 3.5 to 5 feet high and 2-3 feet long. A gentle slope, formed by a number of fallen limestone fragments, covered with low brushwood, makes the entrance perfectly easy. The chief opening, on the east side, in the perpendicular rock is now visible from a distance; formerly it was hidden by the brushwood. It is 41 feet wide and 11.5 feet high. This entrance is level, and dry underfoot, so that there is no difficulty in making use of it. The ground actually covered over by the cave is about 2 000 square feet, and the cubical contents of the whole cave about 10 500 cubic feet. In several places of the relic-bed there were hearths of different sizes, round which in general there were several slabs, which probably were used as seats for those who were sitting round the fire. On the north side of the cave there were three rather large slabs of what is called 'oolitic marble,' imbedded in fine rich loam. These may probably have been used as raised sleeping places or couches. Who had the distinction of occupying them, whether all the members of the clan, or merely the chief, we must leave undecided. At all events, I cannot agree with the view that these slabs were used as hearths or places of offering, for neither the slabs nor the loam show any trace of the action of fire. Under the relic-bed, and extending over the whole of the cave, there was another bed coloured red with oxide of iron, and which consisted, like the others, of crumbled limestone. This bed also contained a number of bones and implements which were better preserved than the others, as they were constantly surrounded with the water of the soil, and thus were less exposed to the decomposing influences of atmospheric air. The bones of the reindeer (Cervus tarandus) were those found in the greatest abundance. 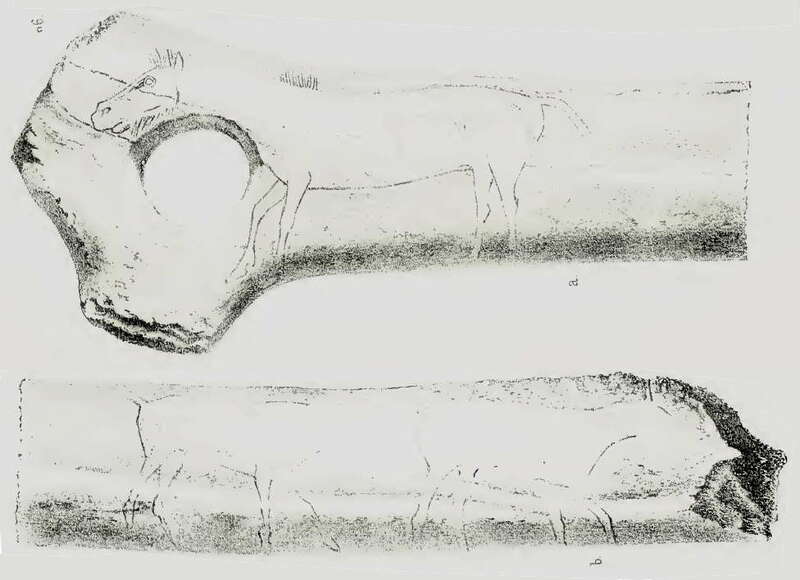 At least ninety per cent of the whole belonged to this animal, as besides a great number of worked and unworked antlers, very many vertebrae, broken bones of the extremities and those of the foot and the toe were met with, and more particularly, a great many broken pieces of the under-jaw, together with the teeth. In all, 250 reindeer had been slaughtered and become food for the inhabitants of the Kesslerloch. A considerable number of bones of the mammoth have been found, amongst which are several portions of the skulls and various bones of young animals of different ages, phalanges of grown elephants, and a large number of broken fragments of great bones. Amongst this varied series of animals the appearance of the cave-lion is of no little interest. Its existence is shown by two canines of a full-grown animal - a right upper-jaw, a right upper tusk, a tooth of the left under-jaw and one of the right under-jaw, and an upper canine tooth of young animals. The remains of several birds were found in the cave; we may mention in the first place no inconsiderable number of bones of the ptarmigan. Not less than eighty right, and the same number of left humeri were found, so that the cave-dwellers had eaten at least eighty individuals of this species. In the first place, we may mention an enormous quantity of flint flakes, at least 12 000 in number, the weight of which may be estimated at nearly seven cwt, or fifty kilograms. A superficial glance is sufficient to discern amongst them three definitely characteristic forms, which are drawn (Plate I. figs. 1 and 4; and Plate II. figs. 6 and 8). The most common forms are those represented in figs. 1 and 8. The length of flints of the first form varies from four inches to less than two inches, and the breadth from eight to six tenths of an inch. At one end the flake terminates in a point more or less decided, while at the other end it is either flattened off level or is bevelled off. This level flattening at one end was evidently intentionally brought about by the tool used for a hammer, so that the flint might be set in a bone handle. The bevelled end of many of the flakes may possibly have arisen in consequence of the fracture caused by the use of this instrument. 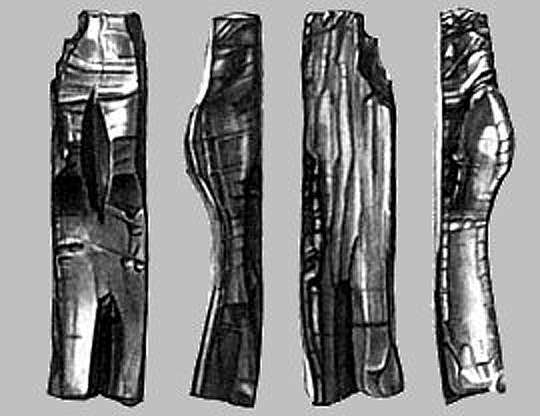 On the middle of the back there extend, more or less prominently , one or two, or, more rarely, three sharp ridges, which originate in the fact that the flint by repeated skilled blows was sharpened like a knife on both sides; hence the name of flint knives. The number of these ridges depends on the number of blows required to make the flint sharp, and therefore it is evidently due to chance. 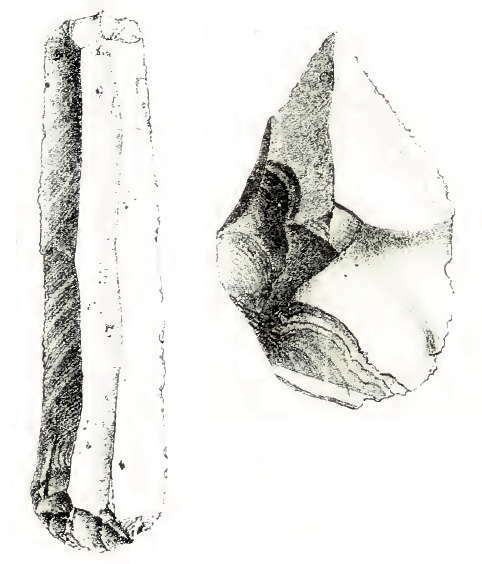 The under side of these flint knives is always smooth, and a trifle arched or curved ; evidently arising from the conchoidal fracture of the flint. Plate 1 Number 1, flint blade, called a spear head in the text. Called respectively a flint knife and a flint spear head in the text. 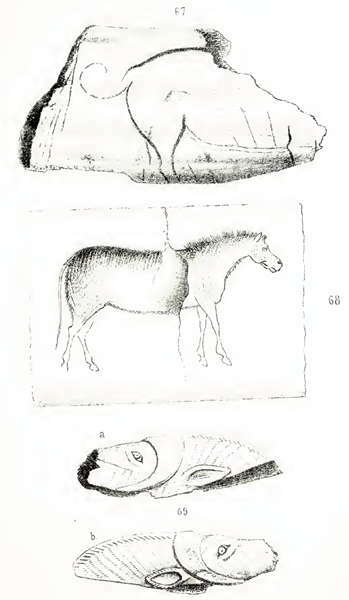 Spear straightener - drawings of a horse and two reindeer. Fig. 67. Drawing, probably of a pig. 68. Drawing of a horse (see also fig. 70), p. 50. 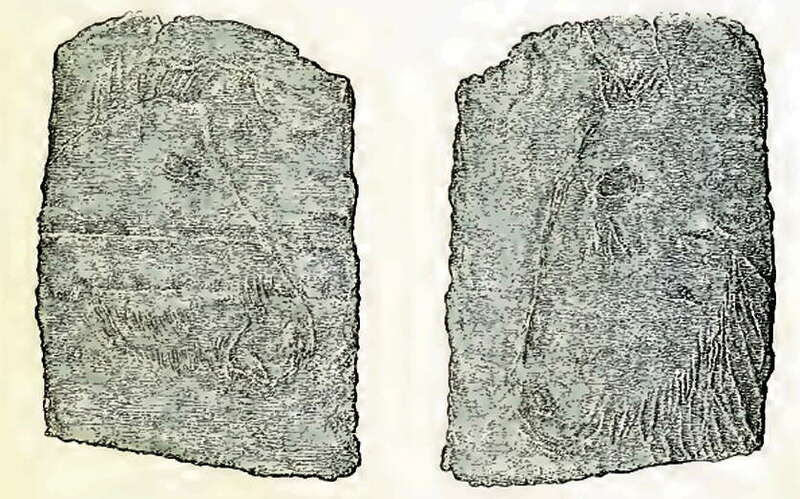 69a and b. Carved head of musk-ox, p. 51. The same claim to artistic skill may be made by the drawings of the horse represented, Plate XII. fig. 70, and Plate XI. 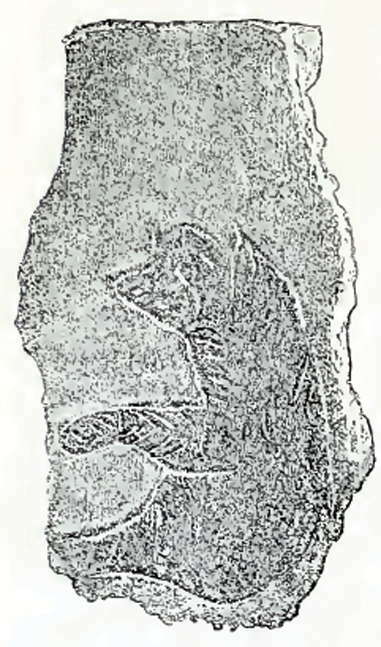 fig 68. 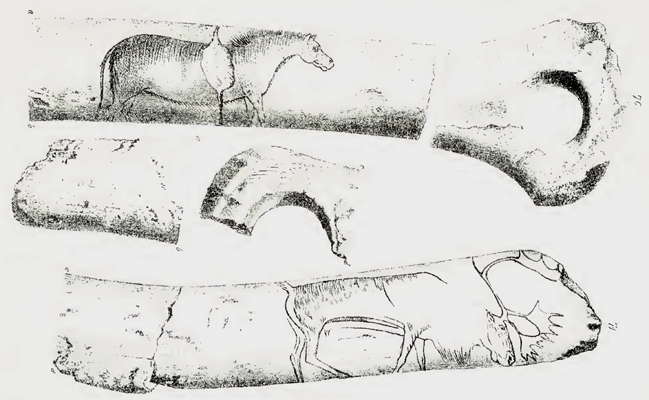 Here the figure of a horse is drawn on a piece of reindeer-horn about 9 inches long and 1.2 inches thick, which is perforated at the end. The fine outlines and shading work appear as sharply cut as if they had been engraved but yesterday, unfortunately the horn was carelessly broken in two when dug up ; by good chance, however, the drawing has suffered but little. As the artist, on account of the limited space, could not quite place the drawing on the upper side of the horn, the hoofs have come on the under side, and thus lose somewhat of their significance. The parallel striae on the neck, the breast, the back, the body, and the hinder part of the animal undoubtedly represent hairs. The well-formed head - rather long, with small ears - the upright mane, the graceful, well - formed body, the elegant and lightly-formed feet, and especially the remarkably thin tail, reaching nearly to the ground, represent without doubt a young well-bred animal. And here again the horse is drawn stepping forwards. The drawing of a reindeer on the spear straightener above, as prepared for the cover of the book. We find some drawings even upon coal. A piece of this substance, about 1.5 inches long and 2.25 inches wide, has on either side of it a head engraved, one of which is less definite and less neat than the other. In both the figures we again find a long mane under the neck, and also on the nape, so that we may conclude that the artist intended to draw the heads of two horses. The eye in one of the figures is very much more artistically drawn than in the other. We find not merely a circular depression, but we can even distinguish the eyelid and the eyeball—here, however, the ears are wanting; while in the other drawing there is an erect ear terminating in a point. Even the hairs about the nostrils are given. On the whole both drawings have been executed with much skill. Two pieces of bone were found amongst the rubbish; one of them was that of a bison; the other probably belonged to a rhinoceros. On the first is scratched or engraved the figure of a fox ; and on the second that of a bear. Both figures are drawn sitting, and from being represented so naturally, form a fitting appendage to the reindeer and the horse. The mode, however, in which the work is carried out betrays the hand of an unpractised artist, for these drawings want the nicety and correctness which the others possess in the highest degree. The Archiv für Anthropologie contains a paper by Herr L. Lindenschmidt, in which he pronounces his conviction that the drawings upon the fossil bones found in the Thayingen Cave are spurious and the result of intentional deception. 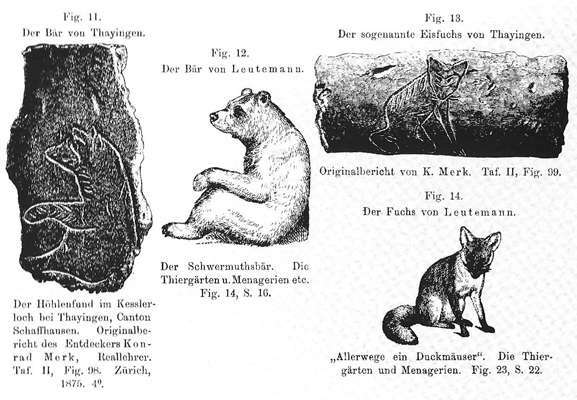 These drawings, which represent a bear, a fox, and a stag, were generally admired in scientific circles in 1874 (when they were found) as being amongst the most perfect specimens of the kind; they also led to the supposition of the highly civilised state of the ancient cave inhabitants. Herr Lindenschmidt produces evidence to the effect that precisely the same drawings are contained in a little work by Leutemann, " Die Thiergarten und Menagerien mit Ihren Insassen," which was published in 1868, i.e. six years before the discovery of the cave near Thayingen. As the work in question had a very wide circulation in Germany the inference drawn is obvious. From the occurrence of this result, with two of the known engravings as undoubtedly proved false, this put at risk the authenticity of all the works of art from the Kessler hole as well as to the authenticity of Ice Age art in general. Such accusations inevitably hurt the integrity and scientific honour of the explorer of the cave, Konrad Merk. To excuse the result, he argued that the two forgeries were not found during his excavations, but only turned up more than a year later. From the first he had doubted their authenticity, and did not include them in his original monograph on the Kessler hole. For these doubts, however, he could advance no valid reasons, and against his will they were subsequently included in the later publication of the cave sites by the Honorary President of the Antiquarian Society in Zurich, Ferdinand Keller. 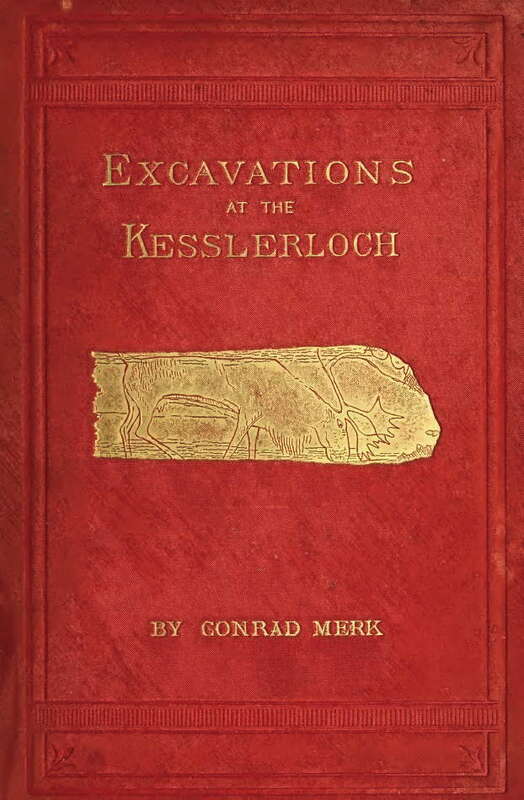 When the rejection of the two pieces by Ludwig Lindenschmits now proved to be justified, this strengthened the suspicions against one of Konrad Merk's earlier workers who claimed to have found them while digging in rubble from the site. After an embarrassing interrogation he was forced to confess that the two engravings were by his cousin, a school student in Schaffhausen, created on bone found in the Kessler hole. Compared with other projectiles, the number of harpoons is very small. Altogether only eight specimens have been found, and they differ very much from one another, both in their workmanship and also in their state of preservation. They may be divided into two classes: those which have the barbs on one side, and those which have them on both. Of the first class we have three, and of the latter five specimens. The first, with the exception of a few barbs, have been preserved entire. One is nearly 6.25 inches long, and in the middle it is nearly a quarter of an inch thick. Both ends terminate in sharp points, one of which is somewhat round, while the other is spread out on the left side so as to form a sharp edge, in which there are several notches or incisions (Plate VII. fig. 35). Both points are about 1.10 inches long. 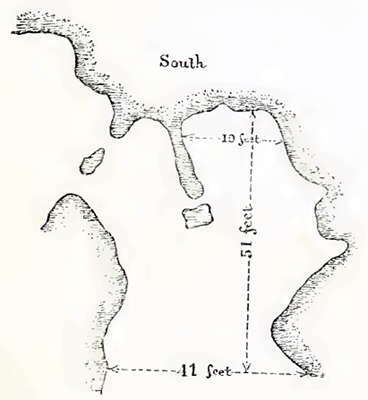 The barbs, five in number, two of which are broken off, become larger, and are wider asunder in the hinder part ; they have been made with wonderful ingenuity and neatness ; their points are as fine as those of our finest steel needles; they are not made to stand at right angles, but run parallel with the shaft. This specimen is the best preserved, and also the best executed of any that have been found. The second class of harpoons, which are barbed on both sides, undoubtedly indicate a greater amount of skill, and must have been more effective than the others, as they would remain fixed in the body of the animal for a longer time. Unfortunately not a single specimen is entirely perfect ; they are all defective either at one end or the other. The specimen of this kind which is in the best state of preservation is drawn, Plate VI. fig. 25: it is about six inches long, and about a third of an inch wide; it has seven whole barbs, and one broken off; all of them are made just like those of the harpoon first described ; they stand opposite to one another, and are oblique, so as to enter more easily into the body of the animal struck. Both on the upper and under sides there is an ornamentation consisting of several double straight lines placed obliquely. It appears to me that the harpoons found in the Kesslerloch were exclusively used as missiles for birds. The especial use of the barbs was to make the harpoon fast in the flesh of the game, so that when it got up into the air, and was escaping, it was prevented from doing so by a string fastened to the barb, and so was captured. The cave-dwellers at St. Madeleine perforated the harpoon in order to fasten the string more easily to it, and the same thing is done by the Esquimaux of the present day. They use harpoons more especially in hunting seals. As the operation of drawing thread by the hand alone through holes made by awls must have required both time and patience, it was natural that needles should have been called in to aid. They were found in tolerable abundance; but of the twelve specimens which came to light only four were perfect. They vary in length from more than 2.5 inches to 1.75 inches. At one end they run to a fine point, while the other end is somewhat flattened and rounded off, and is furnished with a neat round eye to receive the thread. The whole needle is well polished, and in general is as well finished as a steel needle. The eye is so fine and well made that it seems almost impossible to understand how it should have been made with such insufficient tools (Plate IX. figs. 64 and 65), and yet this was actually the case. I have convinced myself of it by repeated trials. I set to work to make one of these eyes by boring from both sides a needle which had been scraped into shape, and continued this manipulation till the perforations on both sides met. If bored only on one side there was a very great risk of breaking the flint point, besides which the diameter of the eye would have been much too large for the part to be perforated. When the needles of the Kesslerloch are closely examined it may be seen very distinctly that the cave-dwellers must have used the same method of boring their needles, for the eye is always the smallest in the middle. I have tried to sew with these bone needles, and was perfectly successful with common linen. I did not venture to try it with thicker material, and it seems to me impossible to do so without breaking the needles to pieces. Two needles found at a later period in the rubbish from the cave are very singular. They are added here by the kindness of Dr. Ferdinand Keller (Plate IX. figs. 62 and 63). In these two specimens the eye is oval, just like that of our larger sewing or darning needles. There can be no doubt but that they were used for thicker thread. They must have been much more difficult to make than those previously described. One of the specimens was never finished, for the part above the eye has not been rounded off. From this it would seem that the eye was probably made first, before the needle was sharpened at one end and rounded at the other, so as to save time in case the needle should break in the process of boring, which doubtless was frequently the case. To the best of my knowledge these two specimens are the only bone needles with oval eyes which were found in the cave. Jakob Nüesch, who excavated in the Kesslerloch. 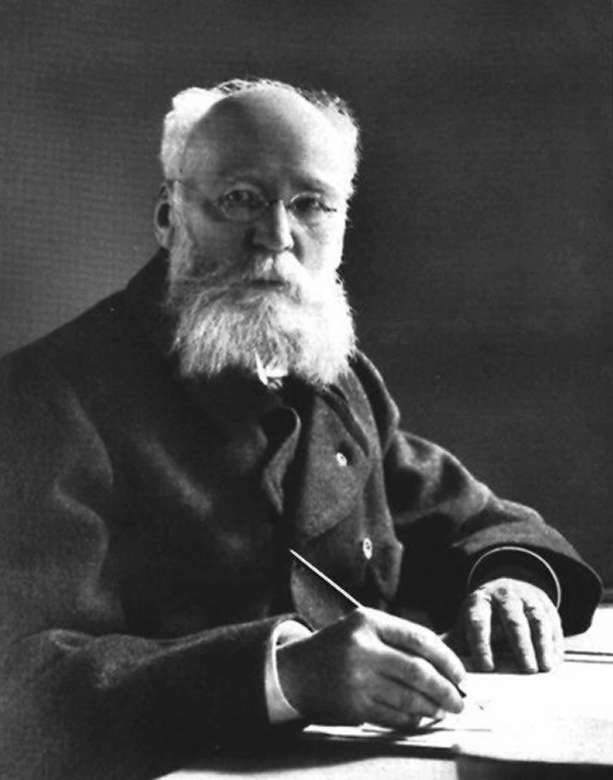 He belonged to the period when archeological excavations were the preserve of amateurs, but he was one of the first to realise the value of bringing in experts in a range of disciplines to help with the interpretation of archeological sites. Details of the book:	Das Kesslerloch: eine Höhle aus paläolithischer Zeit / / Neue Grabungen und Funde von Jakob Nüesch ; Mit Beiträgen von Theophil Studer und Dr. Otto Schötensack. Publisher: Zürich : gedruckt von Zürcher & Furrer ; Basel etc. : Komm. Georg & Co., 1904. Description: 72 p., VI leaves of plates : ill. ; 30 cm. Adam C., Kurz R., 1980: Eiszeitkunst im süddeutschen Raum p. 13, Konrad Theiss Verlag Stuttgart 1980, ( ISBN 3806202419 ) . Lockyer N. (ed. ), 1877: Nature, Volume XV, November 1876 to April 1877.